A DID switch, a dissociation in which a different personality emerges and takes the place of the dominant one, can be painful and bewildering. The sudden pain, change of vision, and closing and re-opening his eyes signal one of Isaac Bittman’s DID switches. Dissociative identity disorder (DID) is a confusing, frustrating mental illness. Someone who lives with DID has within him or her a number of alternate personalities, also called alters or parts. The alters are legitimate identities in their own right, with unique interests, abilities, traits, gender, sexual orientation, and more. The different identities, who can number from two to hundreds, form in the person’s childhood in response to severe abuse. They emerge throughout life, taking over the main personality and causing perplexing problems and situations. Switches originally happen as a defense mechanism to protect the child from horrible abuse; the child dissociates to escape from an unbearable situation, and a different personality emerges in his/her place. Once he or she grows up and the abuse is no longer a threat, why do switches continue to occur? No. This couldn’t be. They weren’t really firing him. It just didn’t make any sense. He didn’t miss work the way they were accusing. He didn’t. He came to work. He didn’t miss. He was confused. Heavy guilt joined the rest of his thoughts and feelings, stomping from his mind down to his heart and kicking hard against it. What about his family? He couldn’t lose his job. The room was slanting and spinning, nauseating him. He didn’t know how to convince them or change their minds, but he needed to. His stress level was rising rapidly, and he was struck across his entire forehead with one of his searing headaches. He closed his eyes and took a deep breath. Isaac had just switched again. In DID, What Triggers a Switch? In both of the above passages from the novel Twenty-Four Shadows, Isaac is experiencing a switch. Every single time he switches, he’s going about his life when one of his alters takes over. Isaac recedes and a different part emerges. A big question Isaac has is why? Isaac to his psychiatrist: I’m really sorry. It’s just that I don’t understand this at all. Dr. Charlie: It’s okay. The experts don’t fully understand it yet, either, but we’ve figured out a lot and we’re constantly learning more. The human brain is so complex that we’ve only just begun to understand it. We do know that it’s strong and it does what it takes to survive. Stress When someone is under duress, one of his/her alters often emerges to help, to ease tension or pain, to solve a problem, or give the primary personality a break. 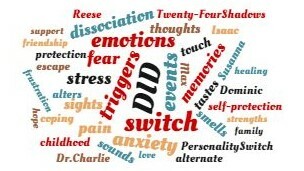 Memories For all of us, memories can evoke strong feelings, and for people living with DID, they can trigger switches. Strong emotions A sudden onset of emotion, either positive or negative, can cause alters to take the dominant spot in the personality system. Sensory input Sights, sounds, smells, textures, and tastes can lead to switches between parts. In looking at things that trigger switches in people who have DID, something important is evident: Every single one of these elements is something that can cause strong reactions in all of us, whether or not we live with DID. People with DID live with a very difficult challenge that was caused by severe childhood abuse. They are triggered by the same things other people are; the difference is that for them, the trigger leads to dissociation and different identities coming forth to live in the world for a while. Switches are stress reactions that cause different parts of a single human being to emerge. What does it feel like to be Isaac Bittman? Check out this short preview.